A folded paper map covering the entire Seattle city limits and a bit beyond. Shows all the streets, parks, block numbers, neighborhoods, etc. 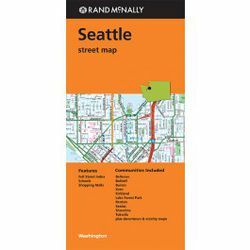 Covers from Shoreline to Sea-Tac including Kirkland, parts of Bothell, part of Redmond, part of Bellevue, Mercer Island, Tukwila, Burien. folded size = 4 1/8" x 9 1/2"